American Urbex is getting back into the saddle and heading south. Thanks to the support of American Urbex contributors this site has been able to document wonderful urbex locations with rich histories. With the help of IndieGoGo, American Urbex was able raise enough to fund trips during the past two summers. The first took us to Gary, Indiana and the second to Cleveland, Ohio. This summer American Urbex would like to break out of the upper midwest. Cities like Atlanta, New Orleans, Montgomery, Memphis, St. Louis and the small rural communities along the way have urbex locations with histories just waiting to be told. Your contribution to American Urbex will help document those under appreciated and neglected places. Contributor funding goes directly to offset the cost of gas, lodging, and food. Whatever remains is poured back into donor fulfillment and administrative costs for online services. Want proof? Here is how American Urbex spent its funds in 2011. No amount is insignificant. Everything is appreciated. 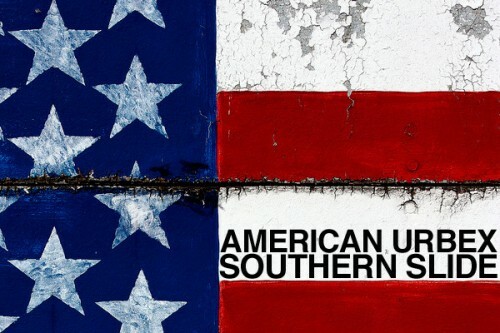 Head on over to the American Urbex: Southern Slide page on IndieGoGo to make your donation. Purchase an American Urbex Print on Etsy. Subscribe to the American Urbex Podcast on iTunes or YouTube. Like American Urbex on Facebook. Join the American Urbex Group on Flickr. Email americanurbex /at /gmail /dot /com with your questions. 01/18/2012 – Thank you to Matt N. and an anonymous donor who have contributed to the American Urbex: Southern Slide fundraising effort. You guys won’t be disappointed if the $500 goal is attained. 01/26/2012 – Thanks are in order for David Smith, Kyle Taylor, and another anonymous donor for their support. The goal is in sight! 02/01/2012 – Special thanks to John Sagehorn and Ariel Powers-Schaub for their direct contributions. 03/01/2012 – It took three years but we finally were able to make the set fundraising goal on IndieGoGo! Many thanks to Greg Valiga for putting American Urbex over the top. Belated thanks are also due for Rick Drew and another anonymous donor. The effort isn’t over though. There is still plenty of time to make this the most urbexenist (sorry) summer ever. 03/25/2012 – Thanks are in order for my extended family for the Quaker Oats container with a mysterious sum of cash. I had no idea any of you actually followed any of what I do. The grand total for the fundraising effort is $735.61! This is the first time in three attempts that the goal on IndieGoGo has been met. $505 came through that channel. Another $230.61 came from direct contributions. Funders can expect something nice in their mailboxes later this year. So what happens now? The money will be used to fund a trip sometime this summer around July or August. The exact itinerary is still up in the air, but hopefully that will lead to more spur of the moment explorations. The important thing is that whatever is found along the way will be shared with others. Thank you again. I can’t wait to create something dirty/beautiful.